From Promptuarii musici (vol. 4), 1617. This edition is offered at original pitch for S.S.A.A.T.T.B.B., or transposed down a fourth for S.A.T.T.T.T.B.B..
Notum fecit Dominus salutare suum: in conspectu gentium revelavit justitiam suam. Recordatus est misericordiæ suæ, et veritatis suæ domui Israel: viderunt omnes termini terræ salutare Dei nostri. 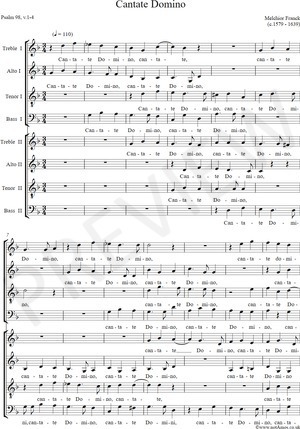 Jubilate Deo, omnis terra: cantate, et exsultate, et psallite. O sing unto the Lord a new song: for he hath done marvellous things. With his own right hand, and with his holy arm: hath he gotten himself the victory. The Lord declared his salvation: his righteousness hath he openly shewed in the sight of the heathen. He hath remembered his mercy and truth toward the house of Israel: and all the ends of the world have seen the salvation of our God. Shew yourselves joyful unto the Lord, all ye lands: sing, rejoice, and give thanks.